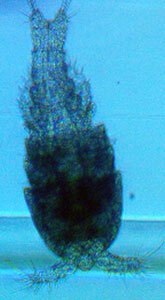 Juvenile Diaptomus with length measurements. 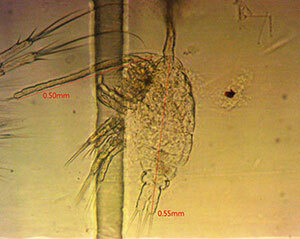 A Harpacticoid copepod from Orzinski Lake. 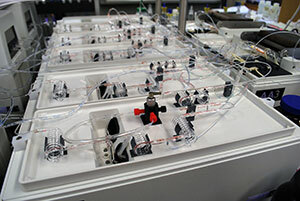 The photosynthetic pigments of chlorophyll a and phaeophytin a are analyzed using a separate spectrophotometer. Zooplankton samples are keyed to the lowest possible taxonomic level. Biomass, density, and length are estimated by area and volume for each taxonomic group. The KILL also determines color, pH, and alkalinity. 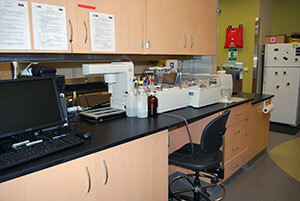 Water samples are stored until processing on site in a dedicated walk-in freezer. All data generated by the KILL are housed in the ADF&G Westward Region limnology database. Methods for lab operations can be found in the Westward Region limnology and Kodiak Island laboratory analysis operational plan.